Where Was That Parking Garage in Mission: Impossible IV? Where in the world did they find that parking garage used in one of the climactic scenes of “Mission: Impossible – Ghost Protocol“? We will offer a three-stage answer. First, the structure in the movie was not in Mumbai, India. Second, it was actually built at the Canadian Motion Picture Park, in suburban Vancouver, British Columbia – which is where most of the movie was actually shot. Third, the inspiration for the parking garage scene came from Volkswagen. The photo at the top of this article is of the interior of a 20-story car tower in Volkswagen’s Autostadt attraction in Wolfsburg, Germany (see its website here). The Autostadt (in German, literally, it translates as “auto state” but “car city” is more what they mean) opened in May 2000, adjacent to VW’s manufacturing plant there. More than two million people visit it each year. Autostadt includes a hotel, restaurants, a museum, and other attractions – in particular the glass “car silos” (yes, there are two of them). If you arrange to purchase a Volkswagen direct from the factory, with factory pickup – you take delivery from these vending machine-like displays. It’s a fully automated procedure whereby the automobile is plucked electronically from a cubbyhole in one of the “twin towers” – each of which holds up to 400 vehicles – and is brought to its owner on a special elevator. The Mission: Impossible version of VW’s auto silo was built by Special Effects Supervisor Mike Meinardus and his crew in Vancouver. It took six months to construct. When it was finished, it worked just like the VW version, and was fully operable. The structure included a 35,000-pound, 78-foot tall center column that supported two 23-foot parking paddles, each of which weighed over three tons. Although the VW version is far larger, the MI IV version held about 70 cars, 18 on each level. Pretty impressive. The filmmakers (including Tom Cruise) wanted the action scenes to be as “real” and “authentic” as possible, so Mr. Cruise (Ethan Hunt) and Michael Nyqvist (Dr. Hendricks) are actually in every shot. The pair of actors were suspended from cables, attached to the ceiling of the structure, as well as to the ends of the paddles to prevent accidental falls between vehicle platforms and to guide planned jumps. Cruise, at one point, makes a three-story leap (shown in photo, above) from a deck level into a car on a moving paddle, slowed at the end of his fall by a decelerator. (The tethering cables were digitally erased in post production). It was “challenging work,” he added, and nearly as dangerous to choreograph at it looked on film. But the cast and crew were elated with the way it turned out. The main scene in Mumbai was actually shot at the Jumeirah Zabeel Saray in Dubai which is a 5 star hotel with a Turkish-Ottoman theme. Great blog! I knew the BMW was a concept but thought the garage was the VW one. You have great info on both and I “pressed” them. Hope you don’t mind. I really like your blog. Merry Christmas. Same to you! Thanks for visiting the site! good blog, yes its true, its not in Mumbai. i saw the car numbers. its not like india registered numbers. so i though its some were else. They need one under the Commons! If you wanna see one of these in Boston? I’m here to help. 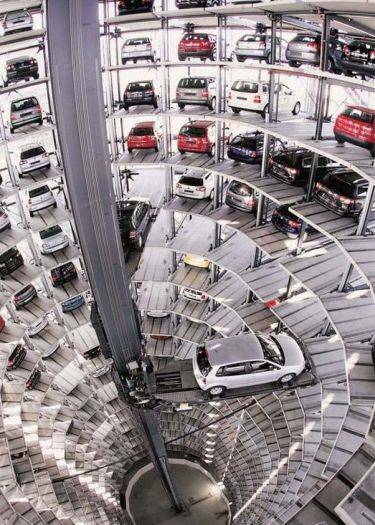 I’m an exclusive dealer in US for German Multilevel Automated Parking Systems like this. I represent my company that has A+ reputation in its industry and been in business for 100 years under the same family management. Nice blog but I have one more question of this scene. Through the end of the movie, there is crash scene with bmw . Tom gets in the car than falls with car and smashes ground of parking garage. Do you know what is the car speed when it hits the ground? Probably less than 15 m.p.h., perhaps even slower, although it looks faster. The fall may even have been manipulated digitally (scenes with the BMW i8 speeding around were manipulated digitally to make it seem to be going much faster than it was) to make the drop seem more severe than it was. The impact was pretty impressive, though. Notice that when the parking garage car starts to go off the edge, there’s a quick cut to a CGI shot of a garage interior that is many stories deep, like the VW Autostadt silo. Actually the movie garage was about four stories high. Physics majors could probably calculate how fast a 3000-pound car would be going after a 30-40 foot drop. But I’m no physics major. Is it a BMW X5 used for the last car fell in the garage with Hunt? No, BMW says it was one of their 1-Series models. Autostadt DOES translate directly to car city. Stadt doesn’t mean state. Thanks. My German causes me all sorts of trouble! There are two glaring mistakes in the shot. The signboards in the parking garage were in a south Indian language (probably Telugu). If Tom wanted to show this garage in Mumbai, either Marathi or Hindi or even English signboards would go very well. Another mistake is already pointed out by someone – the car registration plates are unlike in India. So much for being ‘real’ and ‘authentic’. The level of authenticity in many of the stunts helped divert attention away from the nonsensical level of the plot. The signs were in Kannada, so I thought this might be shot in Bangalore. But Sun TV is a Tamil channel from Chennai. According to the movie, it is meant to be Mumbai but now this blog says it is Inspired by VW in Germany and shot in Canada….!!!! Well not in every movie can you have a Danny Boyle….!! Of course, Slumdog had its own share of goof ups…..but eventually it could leave a lasting impression….However for a movie like MI4 u did require some add ons even if they are don’t exist or even look preposterous like the sand storm in Dubai….Filmakers or even novelists take some liberties in order to stay true to the plot….Just like Bond (007) who even after 23 adventures manages to remain as covert as possible!! The sand storm – unlike 90% of the rest of the stuff that happened in MI4 – is actually a real possibility, any time, anywhere in the Middle East. I saw one exactly like it while I was stationed in Baghdad. They never have storms like that in Dubai. We only get the leftover effects from far away places like Iraq. did anyone notice that the number plates in india were reversed like 4432 E 04 MH instead of MH 04 E 4432?? Yes, I spotted that, too! Not to mention the steering wheels being on the wrong side! Kannnada and Karnataka Rocks in technology. Thats why kannada appears in MI4…. Slight correction. The literal translation of the term “Autostadt” is “car city”. “auto state” is NOT a correct translation, literal or otherwise. “Start” means city or town. The english word “state” translates to “Staat” or “Land” (if you mean a political/geographic state), or “Zustand” or “Lage” (if you mean state to describe a condition). My auto corrector has changed “Stadt” to “Start”. “Stadt” = city, town. they should use those places which are available in the country, and not showing that its belong there. I am guessing almost all the screens of hotel, and etc was not in india. The hotel was the Jumeirah Zabeel Saray in Dubai. I don’t think anything was shot in India. I am cent percent sure they shot @Bangalore because in climax scenes I saw kannada language boards in multilevel car parking building. Y do they use kannada in abroad if they not shot in bangalore. Don’t know sure about Mumbai but Bangalore rocks in MI4 Ghost protocol Thanks Holywood choosing our state capital in their shoot locations adding with Vancouver Prague Moscow and dubai international cities and bringing our capital a international standards in their climax scene.. The last 20% of movie shooted in bangalore watch movie correctly resume movie and zoom the location u get the words with address of bangalore in kannada and english languages in bangalore majestic we all r see the shooting movie…. Sorry, but it was filmed in Vancouver. if you notice the giant “Globe” hanging inside the big building, this is actually the Vancouver Trade & Convention Centre. There is a large Indian population in Vancouver and many extras were available, and the production team replaced any visible signs with those in the proper languages. That scene is pretty impressive and the location plays a big part in it being that way. It has location ,location and location written all over it. 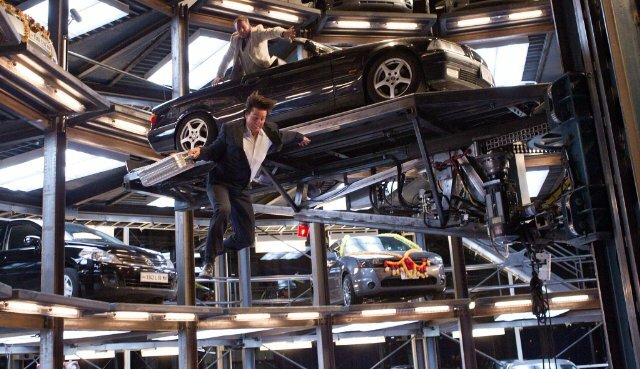 The action sequences that take place in the moving car platforms are well done. On the whole it’s a very watchable movie right from the word go. I didn’t realize how quickly 1 hour and 50 (or so )minutes whizzed away. Time does fly when you r having a good time!!!!!!!!!!!!!!!!!!!!!!!!!! Great write-up. I’m sure many people were very curious about this. However it was built inside a dockyard building in North Vancouver and not at CMPP where the rest of the movie’s studio sequences were filmed. The Vancouver Shipyard Co. facility was the only one tall enough and available for long enough to construct this set. This building (once used to construct large car ferries) has also housed other films with large and lengthy requirements such as 2012 and the upcoming Superman Returns. whether any scene shot in bangalore?in film i saw UDYAANA NAGARA in kannada…..
No, there was none. They didn’t shoot it in India, AT ALL, though originally planned. The entire India set was in Vancouver. Sun Networks portion was shot in an empty (newly constructed and to be leased) office building on Shellbridge Way, Richmond (Suburb of Vancouver). I know FOR SURE, as I used to work in the building right beside the Sun Networks shooting premise. There was a huge crew stationed there, alongwith those Indian 3-wheelers parked outside. Too bad, we couldn’t catch a glimpse of Tom Cruise. I think they shot the sequences at night. So, next time anyone asks you if that was Bangalore? No, that wasn’t. To be precise – Shellbridge Way, Richmond BC. Thanks for taking the time to write and share what you know! I had a question – did they dismantle the garage after filming, or is it still in use? I think they did. I live in Vancouver and we only have one Automated Parking, located in one of the condos downtown. I am sure they dismantled the garage. Millions are spent on movies not for nothing :). All cars except one has left side steering.In India only right side steering is permitted.so it is not a India scene. Stadt actually means city… literally. Not to be confused with Staat which means state .